Enough said, explore it for yourself and subscribe to my feed if you’re interested in my next online project! Hi. I used your theme to put together my site. Modified, of coursem but it provided me with a great layout to work on. Thanks! As always magnificent work, I congratulate. I have localised this template on Russian. I love the theme.. However, I am having trouble with the theme too. I’m not sure if you have experienced this problem in the past, but the theme does not display my header, or title. I inputted my website url on the leave a reply.. Any assistance would be greatly appericiated.. I just get a red x for the header/title/subtitle..
Justin, I’m guessing you’re trying to paste custom logo, right? … contact me on my mail and we’ll see whats the problem. Excellent Theme! Great work done! Have never seen this kind of compiled work for any other wordpress theme. Work of Genious! Well-done! Love the theme! But I was just wondering if there was a way to display the author name of each post on the main screen? I meant getting the author of the post stated on the main preview screen with the post excerpts? Like getting the author name under the post title or maybe beside the date? I’m clueless when it comes to CSS, but is there a way to designate a featured post rather than have it automatically highlight the latest ones? @Frank – I’m not offering this features anymore as WP has it by default. Where? How? – when you publish post you have option to stick a post to the front page. Do that for post you wish to have at top and then just check the number of featured posts you wish to appear on front page (in theme settings). Thanks from brazilian guy !!! @Carlos – Just add new page and choose sitmap as page template. Thanks so much for your wonderful wordpress theme. I’m a novice with wordpress, but am slowly, but surely making headway into blogging. My main, and so far only, problem that I’ve been having with your inuit-types theme, is that my images which are included in posts won’t show up on my front page. Only after you click the post link from the front page, will it take you to the post where the image is included. Is there a simple solution I am overlooking? Also, I cannot get my images to size as cleanly as your demo shows. When I’m using the option of “full size,” the border of the image overlaps the theme’s border and looks relatively unattractive. I hope these aren’t too silly of questions, but I feel if I could get these issues under control, I could really get my blog to take off. You’ll be able to see examples of what I’m referring to at the website address I’ve included. Thanks so much, and I look forward to hearing from you! I’m having the same problem.. Can’t get my post image or excerpt text to show up on the mainpage in the feature post. What am i doing wrong!! Thanks for the great theme – this is by far the best I’ve seen. The next Hemmingway! Željan, grettings from Paris, France! Your theme is just AWESOME. I’m a newbie, an absolute beginner with WordPress, but at the very first moment I saw your work, I knew I was right to start a new blog. I just have a little problem, pretty much like Andrew, with images: if I insert one in my post and then paste the link, I have two images in my final post. And when I do not insert the image (just paste the link), the preview works fine, but the image is not centered in the final post when I open it for reading. Anyway, thanks again, you rock. Really. I find this theme very well created, but after I installed it on the individual post viewing page there was an error with comments displaying. A missing function being reported by PHP. You probably have WP version that doesn’t support threaded comments (under 2.7) so upgrade and it should help. I have been using this theme for a month now and I have to say this is one of the most flexible themes for a beginner like me. One issue I have been facing though is the comments box not being displayed even after it being checked for pages/posts. Any help would be appreciated! Can you give me a link to your blog? I am having trouble getting the ‘image’ in featured posts (both on home page and single post) to show up. I have adjusted the CHMOD on the cache folder as recommended, but that does not work. Is there any other possible change that I can do to fix this? + Uploaded using WP’s image upload tool. Might there be a plugin that is conflicting? http://yoursite.com/. Please whitelist for the domain. Željan, In this theme of a picture (through any fields) are inserted above the text. They cannot be put at the left or on the right so that the text “flowed round” them. That is any such picture hangs over the text, on the right. The big blank turns out. If the photo 300×300 pixels, for example, that to the text is emptiness in these most 300 pixels. If the photo on width of 600 pixels then all is well looked as it on width is equal to a text column and in this case is not present emptiness. How to make what there were no blanks if the small picture (less than 600 pixels) is inserted? For example as in Igloo. You tell, I shall try to formulate a question on another. This problem can is not solved? I’d love to help but cannot figure out what your main problem is,…write your quiestion in plain russian. Hello from Vancouver! As with most people here, I am having trouble with getting images into the feature post. Could you provide detailed instructions? I’m not necessarily a beginner, but followed your early instructions and couldn’t make it work consistently. This theme is great and I would love to keep using it! cache’ folder in theme files not being set to 777. Second most usual problem is that images are not being uploded to blog or are not inserted correctly into custom field named ‘image’. Third most usual problem is that images are being to large or too small. and Fourth most usual problem is with hosting provider. Ask them to add following rules [ 1234234,340151 ] to mod_security for your domain. would work, but I cant see how I can fit that into this theme. any help gratefully received! No need to touch the code, just limit number of entries in WP settings under option Reading. Ah, indeed 🙂 thanks very much for that, and thanks for a fabulous template! I can’t thank you enough for this theme. The half blog, half magazine format is exactly right for my content, giving even attention to the copy and photos. Following through on your clean, simple format, I changed the color scheme to white. Anybody who’d like to see it, go here: http://www.finedivingchicago.com/. Hi — Have you run into any issues with an already installed version of Inuit Types slightly modified… And then upgrading from 2.7x to the new WordPress 2.8? i just have a quick question. how do i remove the meta generator that displays the version of wordpress i am using? it doesn’t seem to work, can you please help me? Try adding this code remove_action(’wp_head’, ‘wp_generator’); in footer,…if that doesn’t help I don’t know what does. Hope to hear from you. Thanks a lot. Yeah, you’re using version of WP preior to 2.7 so it doesn’t work properly, update to latest WP, 2.7 or later. oh thanks for that! i’m done and its already working right! Thanks a lot my friend. Great theme which I am using over at http://www.blog.tropicalismo360.com. Is this a known problem / any solution?? This probably hapens if you insert AddThis buttons inside content on fron page. Theme has excerpted content on front which transforms all links, buttons and stuff like that into plain text. In case you want AddThis to work perfectly open index.php file, find this code: echo strip_tags(get_the_excerpt(), ''); and replace it with this one: echo get_the_excerpt();. Hopefully it works, if not contact me in my email. Well, I tried it very nervously but after when I tried to load the page I just got a syntax error message. I used the editor in the appearance settings – ‘Main Index Template (index.php)’. Was I in the right place? hello! i love this template and i’m planning to use it in my other blogs too. for some reasons, i can’t see where to switch color schemes. help! Same question here. I am not able to find where the settings for the color schemes can be changed. Thanks so much for the free theme! It’s great! I’m having trouble with the RSS Subscribe button, when using Internet Explorer. It works if I use firefox, but when I use IE, it opens up a page full of code… I tried it on other people’s blogs that are using this theme, and the same thing happens! Have you noticed that? If so, can you please help me figure out how to fix it? Waw, a nice modification 😉 … I’m just going through full XHTML validation for all my theme so stay tuned for new updates. Thank you for reporting your issue, I will take it into account when validating InuitTypes. Would it matter that my index file (at the root level) redirects to my wordpress folder? I’ve heard too many redirects are skipped by crawlers..? Anyway, maybe you have some ideas. Thanks a bunch. I want to use your great theme http://icon22.com/q/hello-world/ for er personal blog and is testing it. But as you can see on the link, the button text is gone and so is the Name, mail, website and so on the comment field. Hi, I’ve made a small change to the template to show an excerpt in the featured post (have a look at the site, http://www.insideleft.net to see what I mean). Now, the only thing is that the line spacing in the title text is too close when the title is too long and it flows over onto a second line. Is there a way to increase the spacing, and also to put a space between the title and the excerpt text I’ve just added? I want to show only the 6 post on home page… how to make that? Nevals, there’s a setting in WordPress (so not this theme) that gives you a choice how many posts to show on the home page. I find 7 works well (1 for the big feature post, 6 for the normal posts). It’s under ‘Reading’. Hi Zeljan, my site is having deep conflicts with internet explorer. I’m not a microsoft fan so I use firefox but when trying to acces my blog on explorer half of the entries simply do not show up! The picture is there, the excerpt on the front page shows up but when you click on the article – nothing – and nothing on every second entry. Is Inuit types compatible with the latest version of wordpress (2.8.4)? Željan, excellent theme, mate. Cheers! 1. Try using the “large” version of the image, instead of the original sized image file. It appears that there is some kind of size limit at work that prevents the images from being resized and displaying properly when the original, uploaded image is too large. I’m unsure what that size limit actually is, but that’s what worked for me. You will have to copy-and-paste the code into a plain (ASCII) text editor, save the file as thumb.php, go in your ftp software to …/wp-content/themes/inuitypes/ , rename the current thumb.php file to something else (just in case you need to roll back to it later) and upload the new version in its place. Lastly, Željan, in the theme download some of the directories include a windows file, Thumbs.db, which is invisible in Windows but shows up on the server. No problem, but you might want to delete them. Thanks again for all your work. The Settings page sets a new standard for WordPress developers. I can’t seem to get the footer to accept anything I put in it (footer 1 or footer 2), that is, no widgets. The copyright shows but that’s it. Any thoughts? When you modified it you probably deleted to much code, upload fresh footer.php file and try again. I just started using this theme today on my blog. The footer does not seem to be accepting any widgets. When I apply any widgets to Footer 1 and Footer 2 nothing changes on the website. Tnx for your bug report – footer widgets are not planned to be there. In continuation to my previous post above, I am having trouble in getting “custom.css” to have any effect on the design of the site. I have enabled the use of custom.css in the theme options, but any declarations made in the custom.css file seem to have no effect. Even the example mentioned in the custom.css file. Please help. I am basically trying to change the default fonts. I have a question on the images also. I am uploading the image and it is displaying on the home page as well as in the post. Is there a way to disable the image from appearing in the post. I want the image to only display on the home page with the excerpt and not in the post page itself. Sorry for the multiple posts but questions are popping up as I work with the theme. Found the answer to this one. Sorry I missed that in the theme options. Although I have found one more thing… Is it just me or is there no built in search in this theme? It’s only possible to add search widget. I think there’s an option to hide images in single posts in theme options panel. Where can I change the colour scheme from? I can’t seem to find it anywhere in the options? Open style.css and find the line that styles top navigation – it’s pretty well structured so you’ll find it imediately if you know what you’re looking for. Use in practice, hmmm, try googling it: http://www.google.com/#hl=en&source=hp&q=inuitypes&aq=f&aqi=g-s1&oq=&fp=7d15299a959dbb33. help! i was adding a “share” button to my posts in the Main Index Template (php) and all of a sudden my sidebar became a funny looking footer! what can i do to get the sidebar back onto the side? I’m using your template and it’s great. Currently I only got one little problem. The permalink of an article shows up in front of the content text on the homepage. It ruins the layout a little bit. I want to fix this but I ran out of clues. Can you help me or do you have any idea what might cause this? If you choose to show excerpted content on front text will be stripped of all HTML tags so you’ll get this nasty urls etc. The only solution so far is to show whole post content and include more tag into post where content will break on front page. Trying to get the images to display tried everything listed but nothing works, by placing the link in the custom field provided what does that actually imply? I try on the post to add the link to customs field but it never keeps it?? Please help. Awesome theme!! Great theme. I have one problem: only the title of my featured post appears, how can I get the title and a few lines of the post? Featured posts weren’t planned to include few lines of post so I’d suggest choosing normal post apearance in theme options panel. Thank you for the quick reply! What I really like about your theme is the double columns, but I’d like to have one normal post on top of the two columns. The featured post is perfect except that I only get the topic title. Any thoughts? I believe there’s an option to choose one-column featured post as well, try styling it as normal posts. I got the pictures to display on the front page is there any way to alter the located when you click on the post? It seems to display them at the top of the post to the right is there a way to center them? I think the latest version floats images to the left, otherwise open single.php and change class fl to ac on line 57 to centralize image. Thanks for Inuit Types theme great. The function “read more” is not activated. How can i reactivate it on the theme. Read more is out due to SEO issues, however you may add this code after the_excerpt tag: <a title="Link to ” href=””>Read More. Hi first of all: great theme. Relative dates apply to server configuration and WP>Settings>General Settings>Timezone. 1: A short excerpt on the homepage for featured articles. 2: Better functionality over side widgets. I have the sideposts widget installed (it runs like a second blog) and Inuit overrides changes I want to make to the css of side posts like changing the font size of the article headline – although, oddly enough, I can change the font size of the title I give to the sidepost widget. And functionality over changing fonts and colors on different theme skins – on the black theme skin you cannot change the color of your blog title like you can on the default skin. Also, I have a feeling that there are some minor compatibility issues with the latest wordpress update because since updating I have lost some control over the theme settings options page – check marks in the options boxes no longer show up although the actions are still performed – very strange! 3: A forum for theme uses to share tips and ideas instead of relying on the good grace of Zeljan to help us. Some of the theme users have dumped the theme of late, like Seb – see above – and it would be a shame if this fantastic theme was left to wither. A forum would encourage new users and help the people that support the theme and thus spread its use and popularity. I agree on forum side, … I’m just working on this issue at the moment and promise a lot better support when bizzthemes.com is launched. well, 1 out of 3 isn’t too bad!!! All latest versions come without support for skins as there is custom.css file instead. Try setting up sidebar widgets again, I hope that helps. I got a problem.. when i activate the theme on my own system using XAMPP, it all works perfect.. but when i uploaded it (online to be use on my wp site), i saw a blank screen upon activation of the theme. Can anyone tell me what might be the problem?? You need to deactivate all plugins before theme activation – some plugins are in conflict with theme core files and this turns the screen blank. Can you list which plugins did you use before theme activation? It works fine when i deactivate all the plugins. But will it work when i reactivate all the plugins again??? All my themes have WP-Pagenavi incorporated so you don’t actually need this plugin – other plugins are fine. hi, i really like your theme and have been trying to use it! i do have a coupe issues however… i am a total wordpress novice btw but have been learning a bit. i had v1.6 then installed v1.8 and lost the black skin which i thought was great and was using. is there any easy way to copy the code from dark-black.css file and paste into the custom.css file of v1.8 in order to keep the black theme? i tried pasting and selecting use custom css in the options but nothing changed. You need to activate custom.css in options panel. Regarding signle posts and thumbnails: go to Option panel -> Images & Thumbnails/Featured Images in Single Posts and check option to hide thumbs in single posts. The photos are still not showing up. I changed the Chmod on the cache folder and I asked my host (Host Gator) to add rules 1234234,340151 to the mod security and it still doesn’t work. Can you help me? where can I get the font used in inuit-types wordpress theme logo ? The font is either Tahoma or Georgia, look it up in style.css file. I got a question about inuit types theme, hope you can help me. and it doesn’t work too. i don’t know how to solve it, can you help me? thanks. All WP excerpts are stripped of HTML markups by default, … only the_content tag shows up HTML tags. but, even i use the_content, the HTML tags didn’t show up too. when i check the page source, i found the html tags, all of it. but the theme can not read it, it’s very very weird. If you use the_content HTML tags should appear without problems. Make sure you only use the_content without any other tags addedd, like strip_tags or echo. HTML tags didn’t show up. That’s why I was confused. I added some space and slash within it, ignore them. BTW, when i change theme to default, the HTML markup in excerpt can be show up. Just installed the theme and getting my new site set up. Having issues with the “custom image location”. Can’t seem to get my images to show up. I am using an image that is uploaded to my blog (image example: http://www.knoxvilletnphotographers.com/wp-content/uploads/2010/01/Blog23.jpg) and I chmod the chache folder in the themes file to 777 (it was 755). Still nothing. Any suggestions or advice would be greatly appreciated. View this post for further help. How do I change the background colors on the sidebar?? 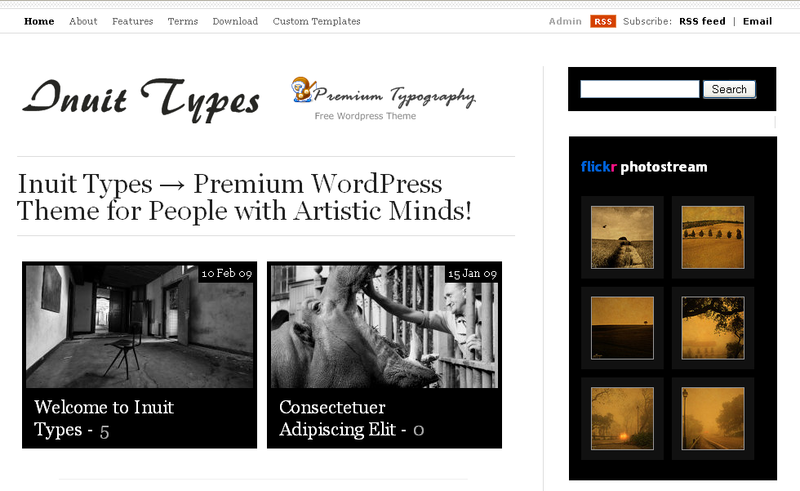 Awesome WordPress theme! Keep them coming. Our web journal is coming along! Why is this not possible? May I override it somehow to get this function back? Gosh just when I started to think about moving to another blog host, I found this amazing WP theme, thank you! Hi, i am running the Inuit Theme (free download) on WordPress 2.9.2 at a local xampp server. Now i’m fiddling around since hours, but the Inuit Types Theme Options Panel dosn’t seem to work. Its there, but I cannot see options, like in that video I had seen. Hi, though it does not work correctly on my local xampp installation, it works fine on the “real” server online. But I can’t find this “front page intro” feature. Is this part of the non-free version? Thanks for this very nice theme. I really like this template. I started using it on a free wordpress blog but just bought a domain and hosting with network solutions. The problem though is that the option to select feature images has totally disappeared. I am a newbie at blogging, so am not so familiar with coding. Pls advise. BizzArtic – Post with image shows up on main page, and also in the particular blog, however images do not appear when you click on the categories. The category listing gives a page with blog title etc but corresponding images are not present. Is this intentional? Thank you. The theme is limited to 10 featured posts. I would like dozens of featured post entries. How can I increase the number? Also, how can I add a third column for all the posts (in addition to the 4th that serves as the column for the widgets)? For those people using a word press hosted blog. To get an image on the main/ front page you need to select “Set Featured image” which is on your “Posts” or “edit posts” page directly beneath “Tags”- where you add tags. Click on this and it will take you to your images/gallery page to select from uploaded images. Obviously you need to upload an image for this to work. Click “show” to select an image and then scroll down to select “use as featured image”. Great Theme!!! I´m loving it. The only problem i found was in the categories widget. Mine is a music blog, so the categories are ordered in type of music and country. But when you click on one of the categories, the page opens with all the posts relates but with no image thumbnail. How do i fix this? i like dark themes. Black!!! i will download this themes. I love the theme. It looks great on the demo but I I am having trouble getting my photo to show as a thumbnail on my homepage as you have it displayed on your demo. I can put the image into the post without any difficulties but I am lost after that. Hi, I hope this thread is still supported. I’d like to switch from my current theme to Inuit Type. To avoid to lose content up in the process I’m trying with a private blog before. I exported the content of my blog to an XML file, then imported it to the mirror blog. Most of the features seems to work fine, even the featured image, except the normal two columns posts doesn’t show a thumbnail, while it does show when opening each post. Is there some particular instruction I should give to each image to show the thumbnails in the front page? Thanks for any help. Are you using the latest theme version? Here it is. However, it only works on self-hosted wordpress.org platform, not wordpress.com, which is supported by wp.com team. Hi! I finished polishing the display of my blog on Inuit Types. I even set a newspaper-like header with the sections through the custom menu. This is my dream came true! I just wanted to let you know how much I thank you for sharing this theme in WP.com. Now it’s up to me to set the path in graphic journalism for others. Today WordPress, tomorrow the World! Ha, ha. Hope you’ll came to visit my “Gloria Mundi” and let me know if you liked it. A million thanks, again. Best luck to you”! Hi..from what I’ve seen on WP, your theme is the best match for me. 1) Only the title is showing on the homepage. 3) The “Read-More” tag is not working. 4) All I have is an image and main title on the home page. In order to see any of the post, I need to click on the link. I’m proud to be using your terrific Inuit Types theme for my WordPress blog. I’m probably one of the few using it whose blog ISN’T a visual/art blog, but rather focused on text and stories instead. Still, the stark black and white color scheme makes it perfect for a blog about storytelling, with just enough visual “punch” from the featured images to liven it up. There’s only one thing I might change, if I could, and that would be to have the option to run the full text of the featured post on the front page UNDER its featured image. Thanks so much for the terrific theme. Hello! I have a wordpress hosted blog and I got interested in your theme because I want to have two columns of content, one with news which will be updated regularly and one with articles which will stay longer. Is that possible, or are both columns fed with the same content? Thanks! Hi- I’m using the wordpress.com version of this, and I’m wondering if I can make four featured images to stay at the top of the template and have any posts that are made to fall underneath them. (instead of knocking them out as the four). Wondering if you can help us to quickly remove the ‘leave a comment’ on the ‘About’ page and the ‘Submit News’ page. Also, if it’s possible for the featured news articles on the main page to directly link to a website instead of a page within our website. Hi, very nice template! I have a question for you. I’m trying to use customized font in this template using css3 @font-face, simply editing custom.css (very nice solution!). The custom font works in the last version of the template 1.9, but not in the 1.8. Both in wordpress.com account (with inuit type template), and also in my local web server with the 1.8 older version downloaded from your site. Do you have some suggestions about this drawback? Is there any chance the anchors on the front page can be changed to just my blog? I have a question about the footer code for the Inuit theme. I’m using the theme for the newsletter of a scholarly association, and we’d like to put a copyright notice in the footer. I see footer CSS code, but there isn’t a footer widget to add content. this is really an awesome theme! I love this theme, and I’m using it on wordpress.com. I was trying to figure out how to change the featured post entries cap of 10 to Unlimited or a specific number you can enter in. Or a link to the method on how to fix this current dilemma complete with the appropriate code. Thank you! Is there an available link to where this discussion has already been started or should be started? I’m new to the blogging world but have started with your fabulous Intuit Types theme. Everything is working swimingly for my elementary knowledge of blogging with 1 exception. When selecting a category, I see the post title and body. Is it possible to see the image as well? I would also like the same feature when I use the search widget. I greatly appreciate your assistance! Hello, thanks for this theme and for its great features. I think that I have figured much most of its potentiality and features but I do have one question: would it be possible to hide the number of comments display for each post on the front page? If yes, how? Thank you! I LOVE InuitTypes. I wouldn’t change it for anything.. . BUT there’s a problem now with WordPress. They’ve done something to the dashboard and none of my posts show summaries anymore, even if I click that option in ‘Reading’. ALL THE POSTS SHOW, now, IS THE HEADING. If a reader opens the post, it’s all there, but a magazine-newspaper layout has to have that first paragraph or two to grab attention. I’ll wait a couple of days – but I’m not the only one who’ll have to ditch your theme if this can’t be fixed quickly. Free Download Classic High Quality WordPress Themes | Free download softwares, music, wordpress template, joomla template, Jquery tools and tips, Beauty tips, Free online video..